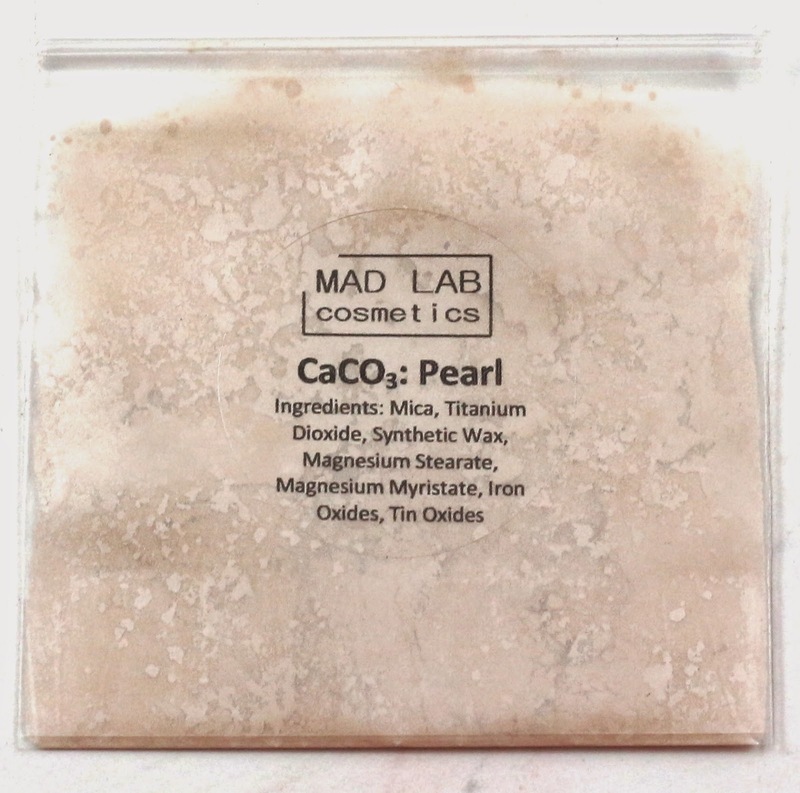 Mad Lab Cosmetics is a brand new indie cosmetics company, available on Etsy, and Catherine, the owner, was doing a special opening sale that I thought I would take advantage of. She is doing very beautiful shades based on stones! How cool is that? Her first collection is inspired by semi-precious stones and I purchased the Blogger Pack so I did get a discount on these as well as the discount code I used from the sale. But just from the first look, I may have to buy the full sizes of all the shades! This order shipped in 10 days via USPS from Southern California to Northern California, and then arrived in 4 days. 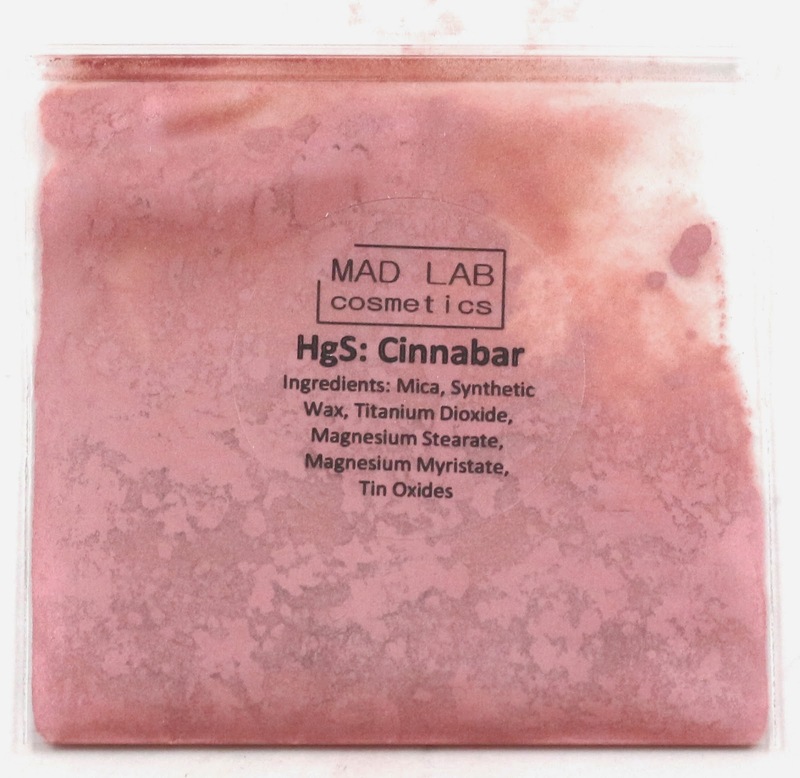 As far as I can find there is no stated turnaround time for Mad Lab Cosmetics. The colors already looked so beautiful in these sample bags, I couldn't wait to dig in (hah rock joke)! This is included the free samples included with my order. 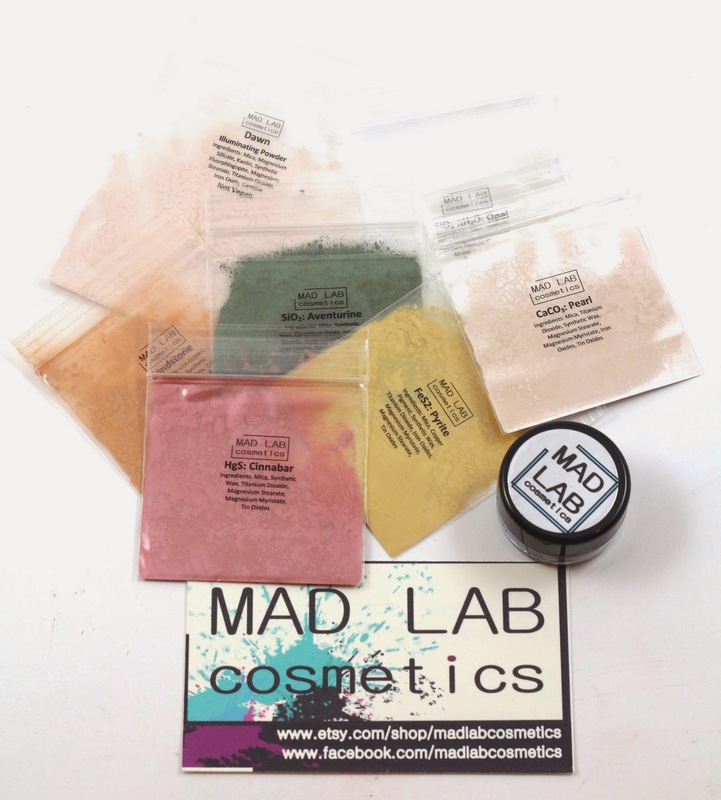 The samples were of products not yet on Mad Lab Cosmetics, so I was very excited to try them! Here is what the sample bags look like, and the full size jar. This is the Semi-Precious Collection by itself. 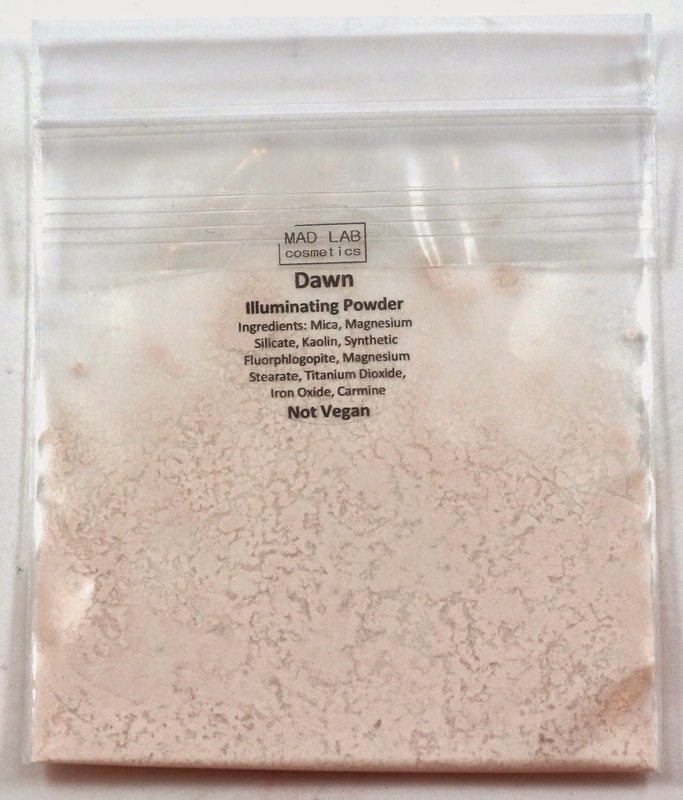 The sample bags don't have a ton of product in them, but definitely enough for at least a dozen uses. And the full size jars have a lot of product in them! So much that it just about overflows every time I open the jar. Aventurine - "Deep grass green over a green-black base. Applied over bare skin it can be blended down to a nearly matte black; while applied wet over over a sticky base, the rich green shimmer brings a glowing finish." This is a really accurate grass green with some darker tones in it. It's a very pretty green, I don't think I have anything like it. It almost looks like it has some golden sheen to it, and I bet it would look really good with a tree bark brown color or a latte color. Cinnabar - "A rich red-pink bordering on ruby with a the slightest hint of berry. Graced with a glowing, metallic finish, apply it wet to create a truly rich foil effect. Neutral enough to be paired with browns for an everyday rose inspired look, yet bold enough to create a color statement all on its own." This isn't quite the reddish shade I thought it would be, but it is a berry pink. This would be nice as a blush or a lip color, but I think I have a few other shades pretty similar to this one. Labradorite - "An ethereal shot of turquoise iridescence over a pitch black base. Matte with shimmer over bare skin, blossoms into shimmering duochrome over a sticky base or when applied wet." The description for this suggests using this as a smoky eye shade, or over Cinnabar for a purple shade! What great ideas, I'll have to try that. I picked this shade as my one full size, and the jar was so full! I had a hard time opening it without getting product everywhere, but I appreciate how much product was in there! I really like doing modified smoky eye looks, so this will probably be the next one I try. Pearl - "A pale cream with a satin/matte finish that provides all the subtlety of a matte finish with the elegance of the finest pearl. The perfect everyday eyeshadow to create a soft brow highlight or a concentrated inner highlight." 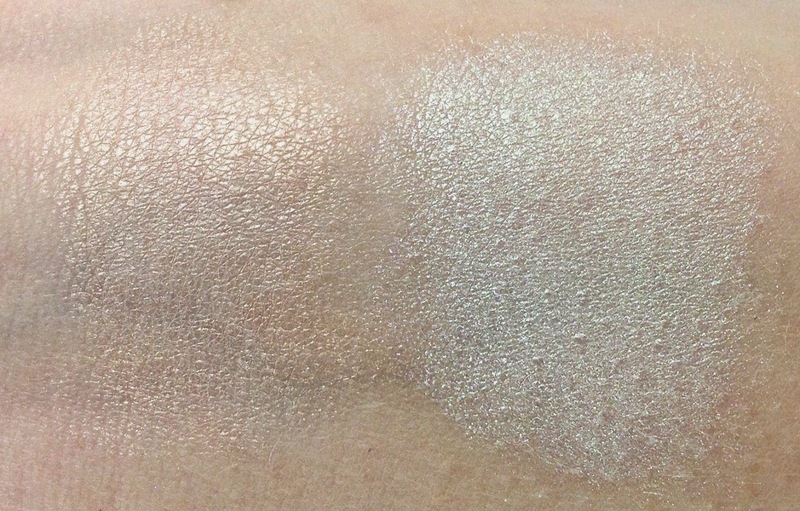 This shade is almost the same color as my skin, so I don't know how well it will work as a highlight, but I will try to make it work! It just has the subtlest sheen on the skin, so it might even work as a face highlight. Pyrite - "A rich, intensely yellow gold with warm hints of copper sparkle and a muted metallic finish. Apply it wet for a burnished effect." 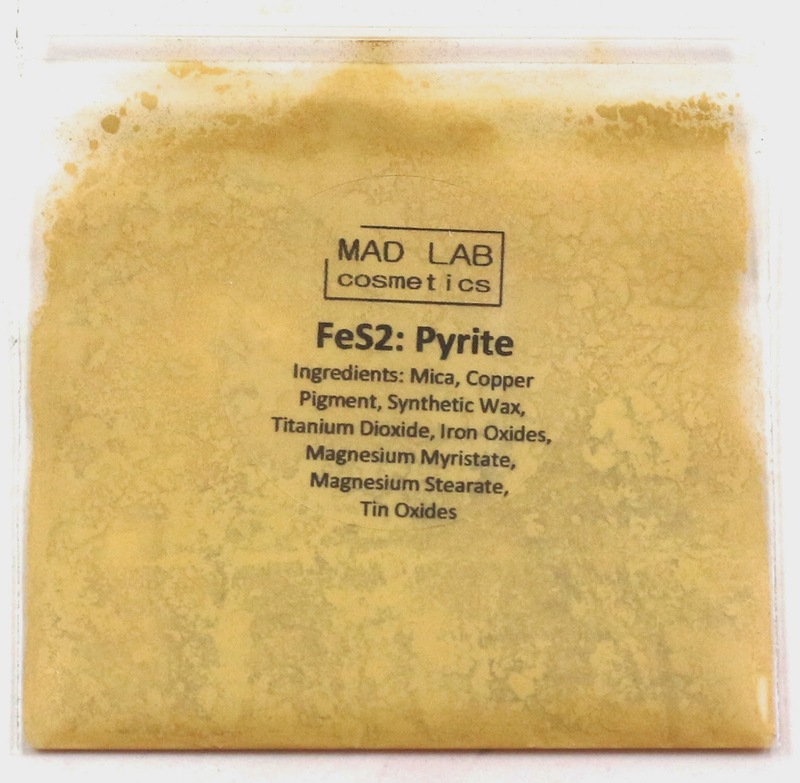 This shade looked more yellow to me than gold, but I think once it was used over glitter glue, or used wet, it might look more gold. This shade would probably look good as a lower lid eyeliner, or in the inner corner as an accent color. 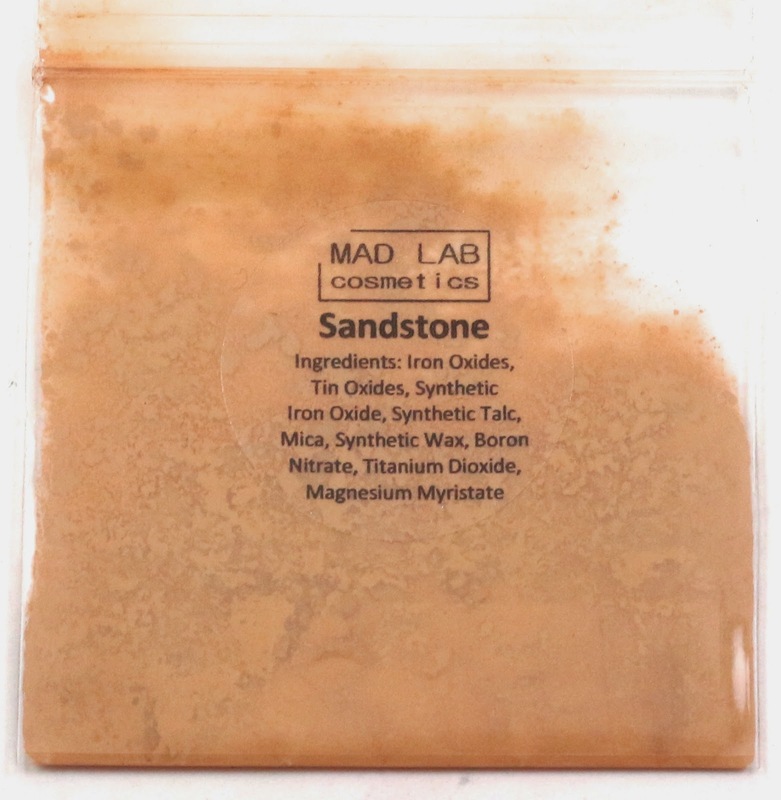 Sandstone - "An extremely warm, medium-light, burnt orange. Never chalky, this smooth eyeshadow is a true matte, free of shimmer or sparkle. Its earthy tones make this a versatile addiction for anyone looking to add some warmth and color to the most work-friendly routines or some softness and contrast to the boldest copper and orange looks." After I swatched this, I forgot it was very orange, and tried to use it as a transition color in a look I was doing. It didn't work out so well, but I think this one would work well as an accent color too. It would also look good combined with a warm brown shade. This was one of my free samples, and it's a product not yet available on their website. This illuminating powder is very subtle, but could be used as an all over highlight, a cheek highlight, a brow highlight, or inner corner highlight. It looks very versatile, I can't wait until it officially becomes a product! Opal - "White Opal is bright translucent white that bursts with green duochrome and violet sparkle. Apply over a sticky or dark base to bring out its true complexities." 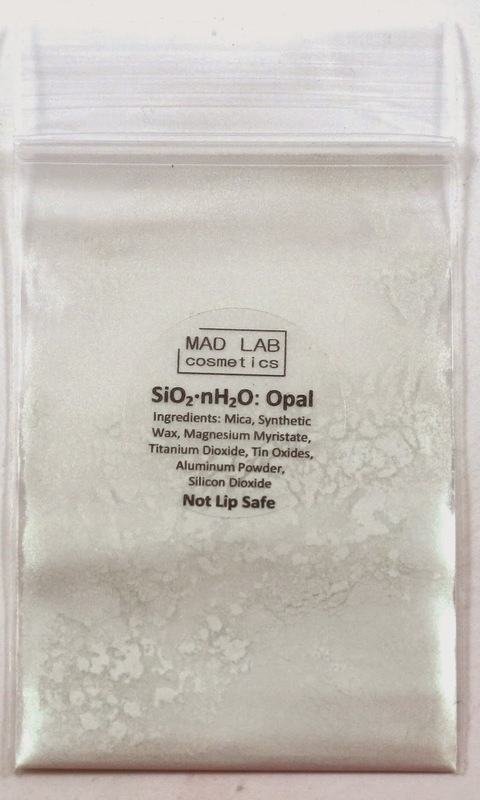 When I received this free sample, this product wasn't yet available, but for October, Mad Lab Cosmetics is offering White, Black, and Pink Opal shadows! I hope that means they do a birthstone eyeshadow for every month! How cool would that be!? It's really difficult to capture the opalescence of this shade, but it's really quite stunning. 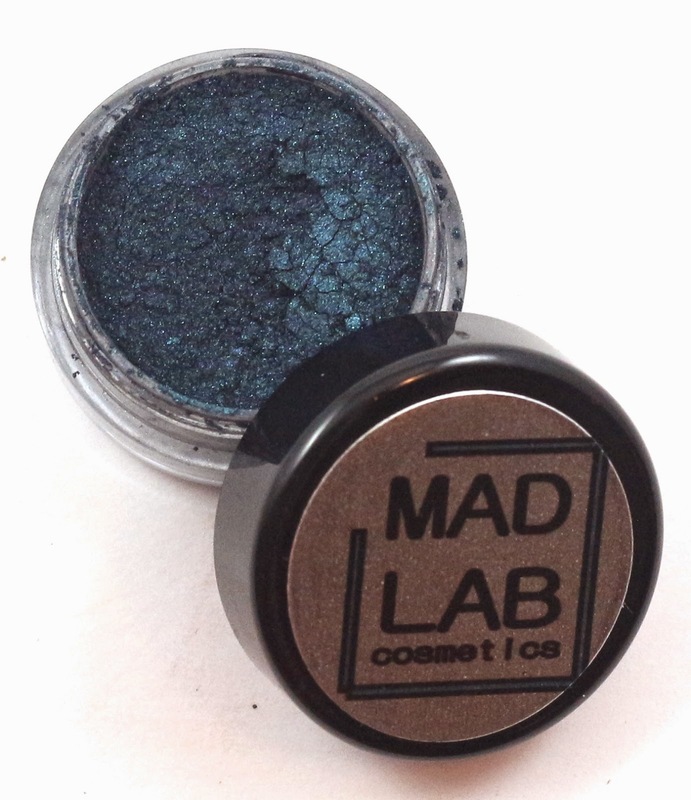 Overall, I am digging Mad Lab Cosmetics and the Semi-Precious Collection! It's such a unique and interesting theme and idea, and I can't wait to try more! 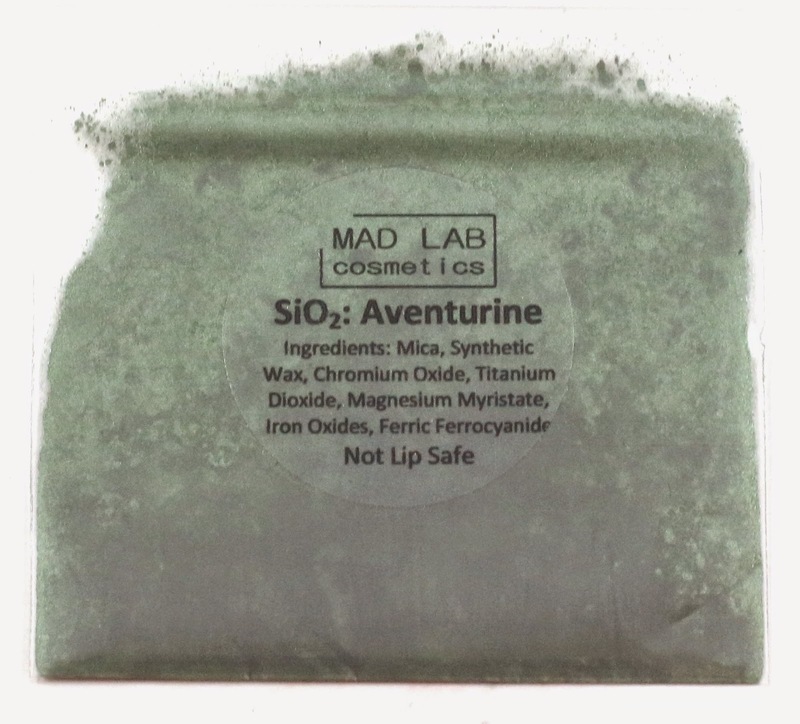 I would say the must get colors from Mad Lab Cosmetics are Aventurine, Labradorite, and then the two new Opal shades. Those are the most unique shades, and the most versatile. Did you get the regular size or deluxe? Just the regular size. The deluxe just upgrades the full size shadow you pick to a 10g jar with a sifter.